MSM Muscle & Joint Comfort Cream is a topical skin-penetrating cream containing a combination of ingredients to relieve joint and muscle soreness both in older people and in athletes. 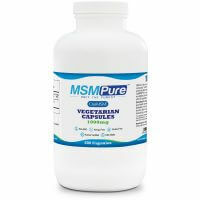 It contains MSM, glucosamine, Capsaicin, CMO and several potent botanical extracts. A topical skin-penetrating cream containing a combination of ingredients to relieve joint and muscle soreness both in older people and in athletes. 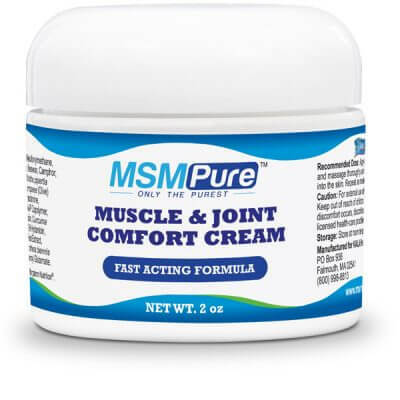 What is muscle & joint cream? 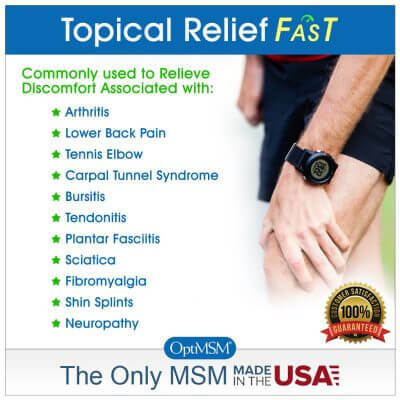 A topical skin-penetrating cream containing a combination of ingredients to relieve joint and muscle soreness both in older people and in athletes. 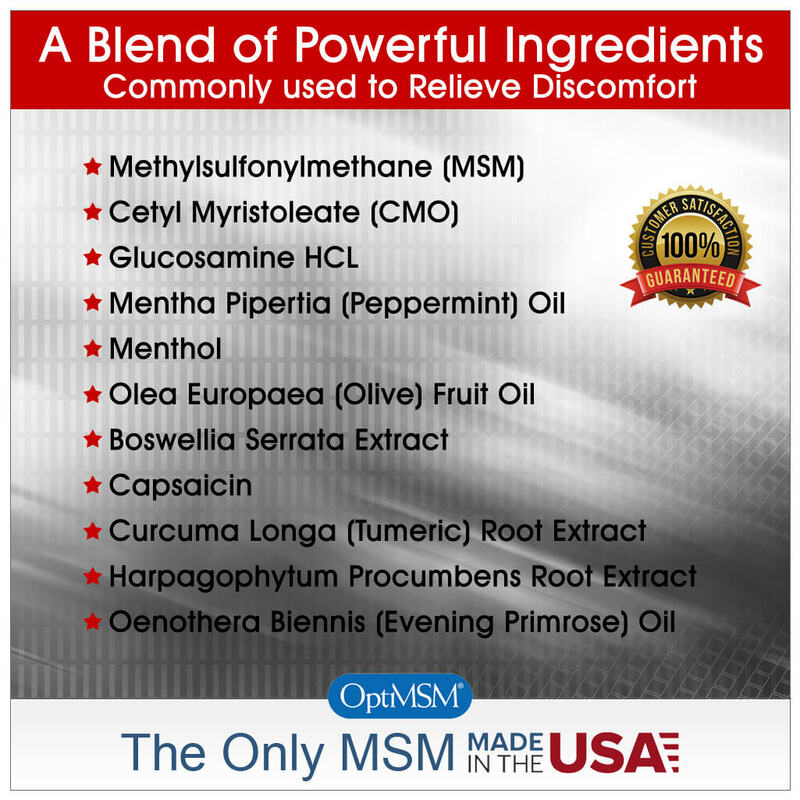 It contains MSM, glucosamine, Capsaicin, CMO and several potent botanical extracts. You will likely experience a warm, stinging sensation when you begin using this cream due to the presence of the 0.05% strength capsaicin. The sensation, which is expected when beginning use, may actually continue for 2 to 4 weeks. The sensation should lessen the longer you use the cream. Reducing the number of daily doses of capsaicin will not reduce the sensation, but it may reduce the pain relief achieved. 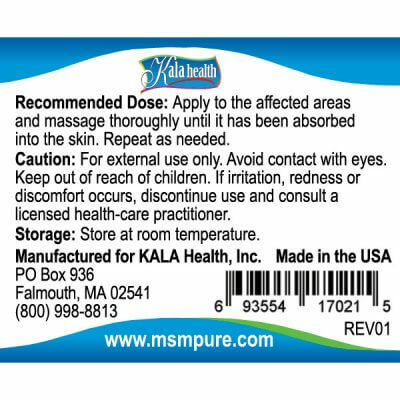 Users report immediate, substantial and long-lasting relief. Can be used in massage therapy in combination with MSM gel. The addition of several beneficial oils and herbal extracts, allow rapid absorption through the skin and give a soothing, cooling sensation which lasts for several hours. Our SmartShip Auto-shipping Program is a NO-RISK Way to SAVE 25% on current and future orders. Deionized Water, Methylsulfonylmethane, Cetyl Myristate, Cetyl Myristoleate, Beeswax, Camphor, Cetyl Alcohol, Glyceryl Stearate, Mentha pipertia (Peppermint) Oil, Menthol, Olea europaea (Olive) Fruit Oil, PEG-100 Stearate, Triethanolamine, Ammonium Acryloyldimethyltaurate/VP Copolymer, Boswellia serrata Extract, Capsaicin, Curcuma longa (Tumeric) Root Extract, DMDM Hydantoin, Harpagophytum procumbens Root Extract, Iodopropynyl Butylcarbamate, Oenothera biennis (Evening Primrose) Oil, Sodium Stearoyl Glutamate. 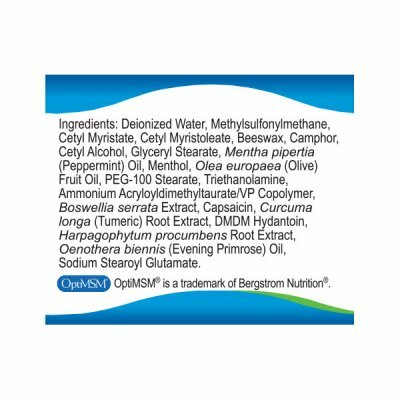 OptiMSM® is a trademark of Bergstrom Nutrition®. 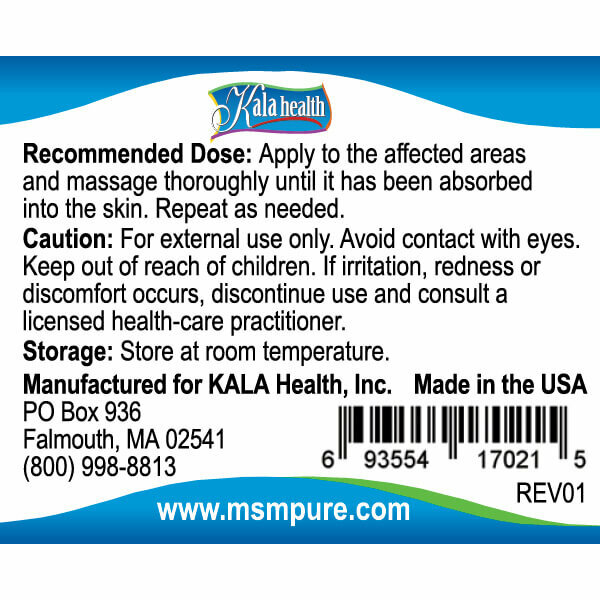 Recommended Dose: Apply to the affected areas and massage thoroughly until it has been absorbed into the skin. Repeat as needed. Caution: For external use only. Avoid contact with eyes. Keep out of reach of children. If irritation, redness or discomfort occurs, discontinue use and consult a licensed health-care practitioner.